Contemporary , stunning home with private beach access. Located in prestigious Lido Shores, only minutes from the fine dining and shopping of world famous St. Armand's Circle. This is a tropical paradise, with floor to ceiling glass showcasing a beautiful pool and lush landscaping. Beach access is resident only - and what a beach! Powder white sand and crystal water await you, away from the tourists and crowds. Bring lunch and picnic on the private beach gazebo. New amenities include six person spa with 23 jets, all new tropical landscaping, completely enclosed privacy fence, new computer with internet access and Wi-Fi. This home is private and beautiful, yet only minutes from all the dining, shopping and entertainment you could desire. Golf, tennis, fishing, boating, jet skis, parasailing are all available in Sarasota; you are also a short drive from downtown theaters, Bayfront, art galleries & botanical gardens; and a short walk from the Mote Marine Aquarium. This is the perfect vacation get away! We will accept reservations for 6 adults maximum. Great location. Close to private access to beach. Walking distance to St. Armand’s. Pool and hot tub are great. Very quiet area. Sunny and bright in living areas, with high glass walls. Giovanni is always prompt and helpful. Easy to get downtown. We have stayed here for three years and had our children and grandchildren stay with us. The only reason we are changing is because our family has outgrown the house...we need 4 bedrooms. We loved being in this house so much we hardly left it during our stay, in spite of the fact that St. Armand's Circle and Lido Beach were only a few minutes away! The overall vibe of the property is total "lifestyles of the rich and famous", with every luxury detail you can think of. It's a combination of peaceful spa getaway and over-the-top island party house where everyone can find a place to call their own. We cooked amazing meals inside and outside at the grill station. It was so nice to be able to toss the wet towels in the dryer so we always had nice, dry towels in the bin. We swam in the lap pool and hung out in the hot tub morning, noon, and night. We did eventually make it over to the private beach which is nothing short of spectacular. Nothing about this house seems like a rental, all the amenities are quality; linens, furnishings, decor, cookware, appliances, etc. I almost wish I could think of something to complain about so this review would seem more believable. All I can say is we will definitely be back to enjoy living like royalty in Lido! I returned to this home for another short vacation as I was greatly impressed last year. The home is perfect for a family get-away, with only a short walk to the beach, as well as a relaxing, private pool which is perfect for cooling off from the afternoon sun. Located in the quiet Lido Shores neighborhood, you are only a short drive or walk (we walked with no problems) to the New Pass Bait Shop, the Salty Dog (delicious food), Mote Marine Aquarium, and St. Armand's Circle. (We could also take a bike ride as the home has more than enough bikes to accommodate an entire family of 5.) The spacious home provides more than enough space with a large family room, dinning area, bonus room, three beds and three full baths! I could not ask for a better place to take my family. The home, as always, was clean upon arrival. Giovanni is always helpful and available to answer any questions, ensuring you have a great stay. I am sure we will return again! This is a beautiful house in highly desirable area. The house has everything that you could wish for. 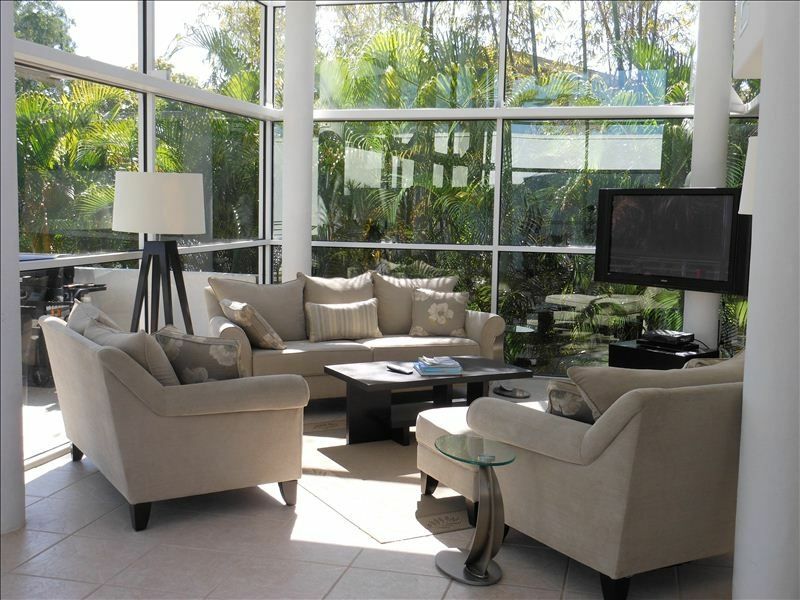 The living area is spectacular and is surrounded by huge glass windows. The bedrooms are spacious and very comfortable and all come with en-suite facilities. A full kitchen provides for everything and off the kitchen is a washing machine and dryer room. There is a den with a big screen tv which was great for watching the World Cup. Air con throughout the house kept things very comfortable inside. The back garden is an amazing area and is surrounded by mature palm trees which provide privacy from neighbouring properties. The pool is superb, there is a huge hot tub and barbecue and outdoor seating area. Nice touches included things like beach towels being provided. There is remote access to the garage which contains a variety of beach gear and bikes of various sizes to fit the whole family. Giovanni who looks after the property was always only a phone call or text away. Private access at the end of the street leads to a beautiful beach ( no more than a 5 minute walk). Siesta Key beach is also well worth a visit. St Armands Circle is only a 15 to 20 minute walk away. Nearest supermarket is about 4 miles away. We had an amazing holiday and spent most of the 9 days that we were there either in the pool at the house or down at Lido beach. We highly recommend that you consider this property if you are visiting the area. The house was so lovely and perfect for our family vacation. The house was very comfortable, the pool/hot tub were lovely, the perfect private beach just a short 5 min walk and only a 10-15 min walk to restaurants (a bit longer if you walk along the beach). It rained briefly for a couple of days but watching and listening to the weather from the living room was wonderful. Great attention to details - there were bikes in the garage, sun hats, a few DVDs, food basics in the cupboards and the house was so clean. We are all looking forward to returning. Our stay was as perfect as always! The house and gracious hospitality are appreciated and made our visit exceptional! Thank you!